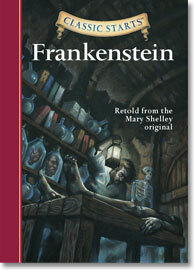 Retold from the Mary Shelley original. Mary Shelley’s tragic story of a scientist who created a monster is perhaps even more compelling and meaningful today than when it was written nearly two centuries ago. From the bits and pieces of dead bodies, and the power of electricity, the brilliant Victor Frankenstein fashions a new form of life—only to discover, too late, the irreparable damage he has caused.